As you build your base of Preferred Customers and your team, your monthly volume or points (‘purchase volume credit’) will grow until they reach 1000 each month; then your business is Qualified. See this Points Chart for full details. When your business is Qualified, you earn 5% on your team. As your team grows, this ‘little’ 5% becomes more and more significant until it represents a large and growing proportion of your total Virtual Franchise income. As ‘mature’ National Marketing Directors the 5% Performance Bonus pays well over 90% of our income. A Qualified Business is a significant achievement on your road to success, and it is the foundation of your business. Your income is directly related to how consistently you qualify your own business and how well you teach and help others on your team to do the same. So, whether this is your life’s work or part-time passion, maximize your time and efforts and qualify your business each and every month, and help others do the same. 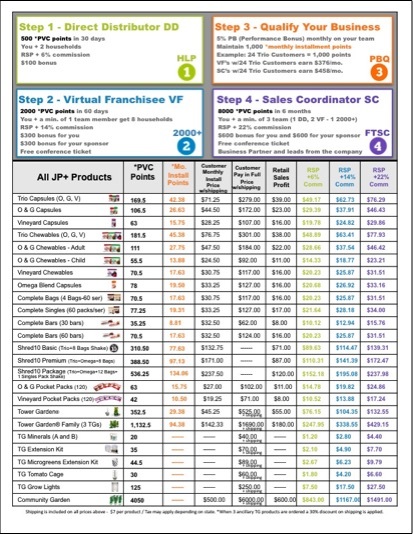 One order for the Juice Plus+ Trio capsules is worth 169.5 points; Orchard and Garden is 106 points; the other Juice Plus+ products are worth about 63-70 points and the Tower Garden is worth 352 points; credit for these points is spread out if when customer pays on the installment plan. Over time, solidify your business by producing more than 1,000 points each month from your own base of approximately 25 Preferred Customer families ordering the Trio or equivalent. Here’s why this “Customer-Self-Qualifying” is so important. Keep using the 20-10-5-1 Success Formula to get you there. The day after close of business (which is usually the last day of the calendar month) is also “Qualifier’s Day“. You can take advantage of this to qualify your business each month, until your qualified business is ‘solid’, and then to help your team to qualify. The picture below illustrates My Business and Team At-A-Glance from the Virtual Office home page. You can see under World Wide PVC Totals (right) 933 points for Performance Bonus (PB), so it’s a little short this month. However, with 1,000 Excess points, they are qualified using that Excess; each month when you have more than 1,000 points the extra or ‘excess’ is carried over to next month to help you qualify – up to 1,000 pvc. Then if you are short, they use that excess to qualify you. They could not be more fair or generous, wanting everyone to succeed! Look at this information at your virtual office as you approach the end of each month and do what you can to get and keep your PB over 1,000. You’ll be glad you did.